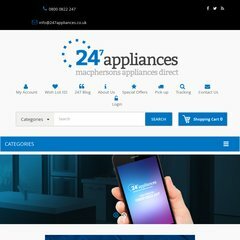 Topics: Built In, Range Cookers, American Fridges, Special Offers, Customer Care, and Pick Up. Age: The domain is 17 years and 8 months old. The estimated 44 daily visitors, each view 2.20 pages on average. It is hosted by Slicehost Texas, using Microsoft-IIS/7 web server. The programming language environment is ASP.NET. Its 2 nameservers are dns2.stabletransit.com, and dns1.stabletransit.com. PING www. (184.106.245.200) 56(84) bytes of data. A time of 13.2 ms, is recorded in a ping test.